As well as my 2014 beauty favourites I will also be posting a few non-beauty 2014 favourites such as blogs and youtubers. This post is all about the main blogs I have been loving throughout 2014, some are new finds and others are old faves. You can check out my favourite blogs of 2013, here. The first blog is The Little Magpie by Amy Spencer, she is so gorgeous and I love all of her outfits *I'm not jealous..., ok, maybe a little* I love her blog design and she also has a youtube channel which I love too! She is petite as I am (well she is taller than me as everyone is) so it is great to see how she styles certain items. Next up are two more fashion blogs, Charissa Rae and Into The Fold both of which always look amazing! Charissa Rae's hair is just gorgeous as are her blog photos; she just makes any outfit look fantastic. Into The Fold by Camilla Ackley has a blog and haircut that is to die for, she always looks so chic. The last couple of blogs are mainly fashion blogs with some beauty and baking thrown in (best combo ever? Yes!). What Olivia Did is the pinnacle of gorgeousness, her blog is so cute and her outfits are always on point - and I want her hair. Definitely check out her blog, instagram etc. The Love Cats Inc by Helen is actually not about cats but it is full of chic outfits, beauty and hunger inducing baking posts. Now onto the beauty blogs, there are so many beauty blogs out there but I had to restrain myself and only pick two otherwise this post would be ridiculously long. 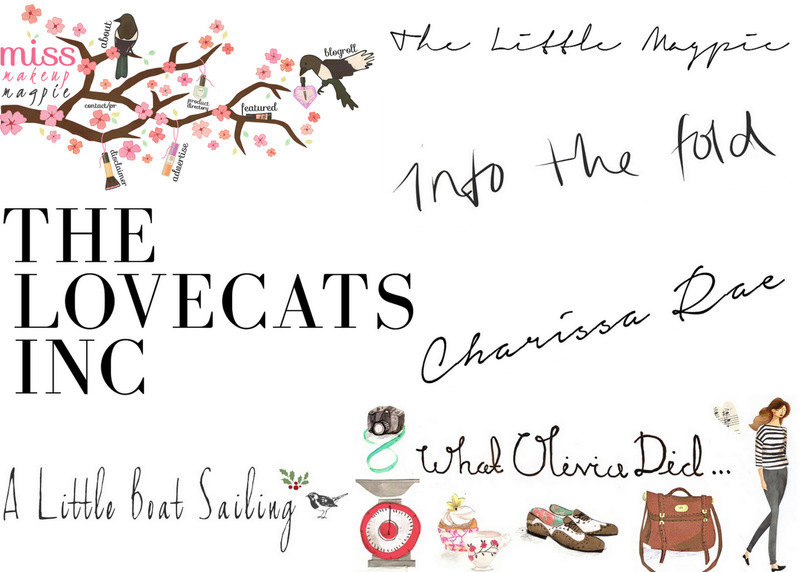 First up is A Little Boat Sailing by Amy and I have to mention her heavenly blog design, it makes me want to read it! Her blog photographs are also fantastic, if your not following already you should be. Last but not least is the wonderful Miss Makeup Magpie by Gemma; not only is her blog so cute but it is filled with all of the beauty posts and reviews you could want! There are my favourite blogs of 2014, although I had to be strict and only include a few otherwise it would be a blog post that never ends! But some honourable mentions go to: the super London Beauty Queen and the amazing Miel Cafe by Giada - she designed my blog and I couldn't recommend her blog design abilities enough! Also check out Temporary Secretary, her photos are as cute as her outfits and pets! Aw thanks for the great blog suggestions, I'll be checking them out! What a nice post! You have good taste in blogs, those listed are some of my faves too! Thanks for sharing, I'm always on the lookout for more blog-inspiration!